Epinephrine or adrenaline (European Pharmacopoeia and BAN) , sometimes spelled "epinephrin" or "adrenalin" respectively, is a hormone when carried in the blood and a neurotransmitter when it is released across a neuronal synapse. It is a catecholamine, a sympathomimetic monoamine derived from the amino acids phenylalanine and tyrosine. The Latin roots ad-+renes and the Greek roots epi-+nephros both literally mean "on/to the kidney" (referring to the adrenal gland, which sits atop the kidneys and secretes epinephrine). Epinephrine is sometimes shortened to epi or to EP in medical jargon. In May 1886, William Bates reported the discovery of a substance produced by the adrenal gland in the New York Medical Journal. Epinephrine was isolated and identified in 1895 by Napoleon Cybulski, a Polish physiologist. The discovery was repeated in 1897 by John Jacob Abel.. Jokichi Takamine, a Japanese chemist, independently discovered the same hormone in 1900.In 1901 he isolated and purified the hormone adrenaline from cow glands.It was first artificially synthesized in 1904 by Friedrich Stolz. Epinephrine is a "fight or flight" hormone, and plays a central role in the short-term stress reaction. It is released from the adrenal glands when danger threatens or in an emergency. Such triggers may be threatening, exciting, or environmental stressor conditions such as high noise levels or bright light (see Fight-or-flight response). An example of noise-induced trigger of epinephrine release is tinnitus. The fight-or-flight response caused by tinnitus is a contributor to physical stress seen in tinnitus-patients, exacerbating the case. When secreted into the bloodstream, it rapidly prepares the body for action in emergency situations. The hormone boosts the supply of oxygen and glucose to the brain and muscles, while suppressing other non-emergency bodily processes (digestion in particular). It increases heart rate and stroke volume, dilates the pupils, and constricts arterioles in the skin and gut while dilating arterioles in skeletal muscles. It elevates the blood sugar level by increasing catalysis of glycogen to glucose in the liver, and at the same time begins the breakdown of lipids in fat cells. Like some other stress hormones, epinephrine has a suppressive effect on the immune system. Although epinephrine does not have any psychoactive effects, stress or arousal also releases norepinephrine in the brain. Norepinephrine has similar actions in the body, but is also psychoactive. The type of action in various cell types depends on their expression of adrenergic receptors. It binds to Î±1 receptors of liver cells, which activate inositol-phospholipid signaling pathway, signaling the phosphorylation of glycogen synthase and glycogen phosphorylase (inactivating and activating them, respectively), leading to breakdown of glycogen (glycogenolysis) so as to release glucose to the bloodstream. Epinephrine also activates Î²-adrenergic receptors of the liver and muscle cells, thereby activating the adenylate cyclase signaling pathway, which will in turn increase glycogenolysis. Î²2 receptors are found primarily in skeletal muscle blood vessels where they trigger vasodilation. However, Î±-adrenergic receptors are found in most smooth muscles and splanchnic vessels, and epinephrine triggers vasoconstriction in those vessels. Epinephrine is used as a drug to treat cardiac arrest and other cardiac dysrhythmias resulting in diminished or absent cardiac output; its action is to increase peripheral resistance via Î±1-adrenoceptor vasoconstriction, so that blood is shunted to the body's core, and the Î²1-adrenoceptor response which is increased cardiac rate and output (the speed and pronouncement of heart beats). This beneficial action comes with a significant negative consequenceâ€”increased cardiac irritabilityâ€”which may lead to additional complications immediately following an otherwise successful resuscitation. Alternatives to this treatment include vasopressin, a powerful antidiuretic which also increases peripheral vascular resistance leading to blood shunting via vasoconstriction, but without the attendant increase in myocardial irritability. Because of its suppressive effect on the immune system, epinephrine is used to treat anaphylaxis and sepsis. Allergy patients undergoing immunotherapy may receive an epinephrine rinse before the allergen extract is administered, thus reducing the immune response to the administered allergen. It is also used as a bronchodilator for asthma if specific beta2-adrenergic receptor agonists are unavailable or ineffective. Adverse reactions to epinephrine include palpitations, tachycardia, anxiety, headache, tremor, hypertension, and acute pulmonary edema. Because of various expression of Î±1 or Î²2-receptors, depending on the patient, administration of epinephrine may raise or lower blood pressure, depending whether or not the net increase or decrease in peripheral resistance can balance the positive inotropic and chronotropic effects of epinephrine on the heart, effects which respectively increase the contractility and rate of the heart. Epinephrine is synthesized from norepinephrine in a synthetic pathway shared by all catecholamines, including L-dopa, dopamine, norepinephrine, and epinephrine.Epinephrine is synthesized via methylation of the primary distal amine of norepinephrine by phenylethanolamine N-methyltransferase (PNMT) in the cytosol of adrenergic neurons and cells of the adrenal medulla (so-called chromaffin cells). PNMT is only found in the cytosol of cells of adrenal medullary cells. PNMT uses S-adenosylmethionine (SAMe) as a cofactor to donate the methyl group to norepinephrine, creating epinephrine.For norepinephrine to be acted upon by PNMT in the cytosol, it must first be shipped out of granules of the chromaffin cells. This may occur via the catecholamine-H+ exchanger VMAT1. VMAT1 is also responsible for transporting newly synthesized epinephrine from the cytosol back into chromaffin granules in preparation for release. Adrenocorticotropic hormone (ACTH) and the sympathetic nervous system stimulate the synthesis of einephrine precursors by enhancing the activity of enzymes involved in catecholamine synthesis. The specific enzymes are tyrosine hydroxylase in the synthesis of dopa and enzyme dopamine-Î²-hydroxylase in the synthesis of norepinephrine. ACTH also stimulates the adrenal cortex to release cortisol, which increases the expression of PNMT in chromaffin cells, enhancing epinephrine synthesis. This is most often done in response to stress. Unlike many other hormones, epinephrine (as with other catecholamines) does not exert any negative feedback to down-regulate its own synthesis. In liver cells, epinephrine binds to the Î²-Adrenergic receptor which changes conformation and helps Gs, a G protein, exchange GDP to GTP. This trimeric G protein dissociates to Gs alpha and Gs beta/gamma subunits. 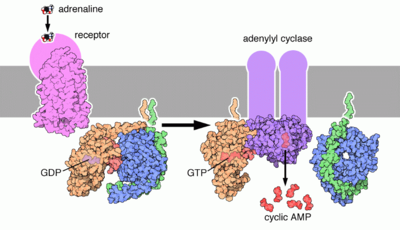 Gs alpha binds to adenyl cyclase thus converting ATP into Cyclic AMP. Cyclic AMP binds to the regulatory subunit of Protein Kinase A: Protein kinase A phosphorylates Phosphorylase Kinase. Meanwhile, Gs beta/gamma binds to the calcium channel and allows calcium ions to enter the cytoplasm. Calcium ions bind to calmodulin proteins, a protein present in all eukaryotic cells, which then binds to Phosphorylase Kinase and finishes its activation. Phosphorylase Kinase phosphorylates Phosphorylase which then phosphorylates glycogen and converts it to glucose-6-phosphate. Although widely referred to as adrenaline outside of the US, and the lay public worldwide, the USAN and INN for this chemical is epinephrine because adrenaline bore too much similarity to the Parke, Davis & Co trademark adrenalin (without the "e") which was registered in the US. The BAN and EP term for this chemical is adrenaline, and is indeed now one of the few differences between the INN and BAN systems of names. Amongst US health professionals, the term epinephrine is used over adrenaline. However, it should be noted that universally, pharmaceuticals that mimic the effects of epinephrine are called adrenergics, and receptors for epinephrine are called adrenoceptors. Natural epinephrine is the (R)-(âˆ’)-L-epinephrine stereoisomer. Aronson JK (2000). "Where name and image meet" - the argument for "adrenaline". British Medical Journal 320, 506-9. Yamashima T (2003). "Jokichi Takamine (1854-1922), the samurai chemist, and his work on adrenalin". J Med Biogr 11 (2): 95-102. PMID 12717538. Bennett M (1999). "One hundred years of adrenaline: the discovery of autoreceptors". Clin Auton Res 9 (3): 145-59. PMID 10454061. About.com - "The Definition of Epinephrine"
Voet D. and J. (2004). Biochemistry, 3rd ed. USA: Wiley. ISBN 0-471-19350-x.